Perhaps you wonder why it is so easy to empathize with another person, or why you feel hungry when you see someone eating a sandwich, or why you feel the urge to yawn when you see someone else yawn. Mirror neurons are thought to be key in how humans relate to each other. When one person watches another person doing a task, mirror neurons fire in the observer as if they were also performing the task. The same phenomenon is observed in animals. Researchers from Duke University have conducted research that suggests that mirroring in monkeys is influenced by factors like proximity, social hierarchy, and competition for food. The researchers created a multi-channel wireless system that recorded the electrical activity of hundreds of neurons in the motor cortices of two monkeys as they interacted. This new system allowed researchers to track exactly which neurological changes were going on in the monkeys’ brains while they were interacting— something that has not been done before. When monkeys interacted during a social task, their brains were highly synchronized— their neurons fired at the same time. 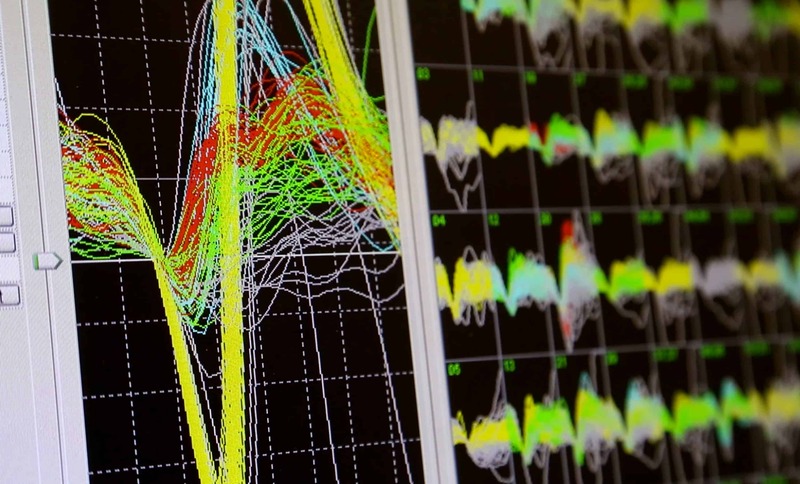 A computer screen displays one monkey’s brain activity. Image credits: Shawn Rocco/Duke Health. For the main experiment, a “passenger” monkey was placed in an electric wheelchair that was steered across the room to a reward, a fresh grape. A second “observer” monkey was also in the room watching the first monkey. The activity of both brains was recorded at the same time. A lot of the time, the two monkeys had synchronized neurons. The synchronization could predict the location and velocity of the wheelchair, as well as how close the animals were together and how far the passenger was from the reward. The brain activity also depended a lot on the social rank of the monkey. When a dominant monkey was the passenger, the brain synchronization increased as the passenger approached the observer and peaked when they were three feet apart—a distance close enough to groom or attack. When the roles were reversed, synchronization did not increase as the lower ranked monkey approached the dominant monkey. Apparently, it is not so important when a subordinate monkey approaches, perhaps they are a lower threat. The researchers believe that the synchronization was generated by the activation of both monkeys’ mirror neurons at the same time. Similar brain synchronization could occur in humans as well. In conditions such as autism, the functioning of mirror neurons is disrupted. This research could thus help to treat autism. It could also be used to gauge how well different groups work together. The researchers plan to test these ideas on people next, using functional MRI and electrode caps. The journal reference can be accessed here.